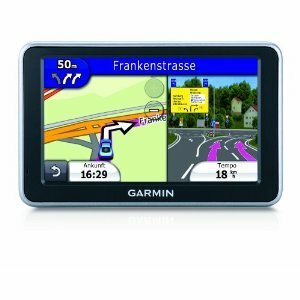 The 5-inch nüvi 2460LT is preloaded with City Navigator NT street maps for 24 countries in Western Europe, has premium traffic avoidance for the lifetime of the unit and advanced navigation features including automatic speech recognition, PhotoReal junction view and nüRoute technology predictive routing. Its so easy to operate, not only does it tell you where to turn but it responds to your spoken menu or navigation commands. With innovative speech recognition, you can control this nüvi with your voice while keeping both hands on the wheel. Simply wake up the sat nav with your customisable voice command, then speak the menu option you require from the options clearly displayed on the screen. Tell nüvi "Find Address" and say where you're going to start navigating. Premium lifetime traffic avoidance alerts you to traffic delays and roadworks on your planned journey and finds a route around. nüvis multi-point route planner automatically sorts multiple destinations into the most efficient route. Text to speech speaks upcoming street names on your journey for extra route awareness, letting you keep your eyes on the road, not on the sat nav. Lane Assist shows the correct lane choice for upcoming junctions and motorway exits ' so theres no need to panic, hesitate or make last-minute lane changes, even on unfamiliar routes. PhotoReal junction view adds accurate landscape detail and road signs for upcoming exits and junctions for exceptional clarity of detail down to the exact trees and pylons! nüRoute myTrends learns your driving habits and recognises your favourite destinations to predict where you're going - saving time otherwise spent activating your route. With trafficTrends, nüvi 2460LT automatically learns traffic flow trends reported by other drivers to improve your routes and better estimate your time of arrival based on time of day and day of week. So whether youre driving to and from work or a regular weekly event, nüvi 2460LT will help you get there on time. With built-in Bluetooth wireless technology, microphone and speaker, nüvi 2460LT can sync with your mobile phone for safer hands-free calling. Access your call log and phone directory via the sat nav screen and answer incoming calls with a tap of your finger. The integrated unique Cyclops safety camera warning system gives real-time, direction-relevant and accurate alerts with overspeed warning as you approach one of hundreds of fixed, mobile, variable limit and temporary safety cameras. nüvi 2460LT also contains speed limits for all major routes and you can manually correct and update road speeds and share any changes with other users via USB. Automatic Speech Recognition responds to your spoken menu and navigation instructions with custom "wake-up" command"